The Brittany is a medium-sized, leggy, dual-purpose dog, equally suited for sport and companionship. According to AKC? Registration Statistics, it has surged in popularity in the last 50 years due to its talents as both a hunting and show dog. 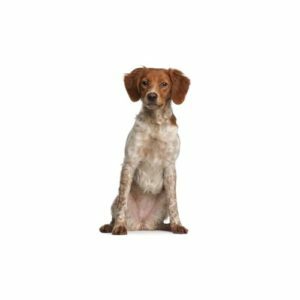 Originally called the Brittany Spaniel, it is now referred to simply as the Brittany, as its hunting style more closely resembles that of pointing breeds. Its dense, flat or wavy coat can be orange and white or liver and white in either clear or roan patterns. Average size: 30 to 40 pounds and 17 ?_ to 20 ?_ inches at the shoulder.